My Beloved Uncles, directed by Eran Barak, is a compelling look at a neighborhood, a quirky family, and a quest for dreams and hopes. Produced in the style of a personal documentary, the film also covers the phenomenon of kidnapped Sephardi babies during the early years of the state. This is not just a standard documentary -- it also makes use of creative elements which add to its unique nature. Pardes Katz, north of B'nai Brak, was an immigrant community built in the 1950s, later turned into a slum. Today, the filmmaker says he can't run away from it. His grandparents, who came from Tunisia, raised their family here. They had a son named Yisrael, born in 1949, who disappeared from the local hospital when he was almost a year old. The family was never shown a body or a burial site. The filmmaker takes us to meet his grandmother who till this day believes that he was taken from her by the Ashkenazim and is still alive, living somewhere in Israel. The beloved and lovable uncles make the film so quirky and special. 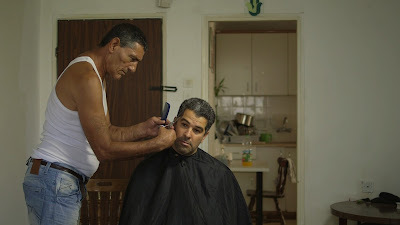 Uncle Gabi, for example, is a real character, who lived most of his life in Israeli prisons. He talks about how he always wanted to fit in, to be like other people, and to prove it, he wanted to have an Ashkenazi wife. But realizing one's dreams is not always within reach. Another uncle talks about how he wasn't like Gabi -- although they were very close, he never stole anything, except for a few cars here and there! And a third uncle still drives around in a horse-drawn buggy, collecting scrap metal, searching for a wife. My Beloved Uncles (documentary, 72 minutes) is available from Ruth Diskin Films.